Home Reliable What is Gaslighting? Gaslighting is a powerful and destructive tool that a Person will use to manipulate and intimidate their Victim. It is a form of psychological abuse where false information is presented to the Victim, making them doubt their own memory, perception and often their own sanity. A classic example of gaslighting is to switch something around on someone that you know they’re going to notice, but then deny knowing anything about it. The Person will explain to the Victim that they must be imagining things. 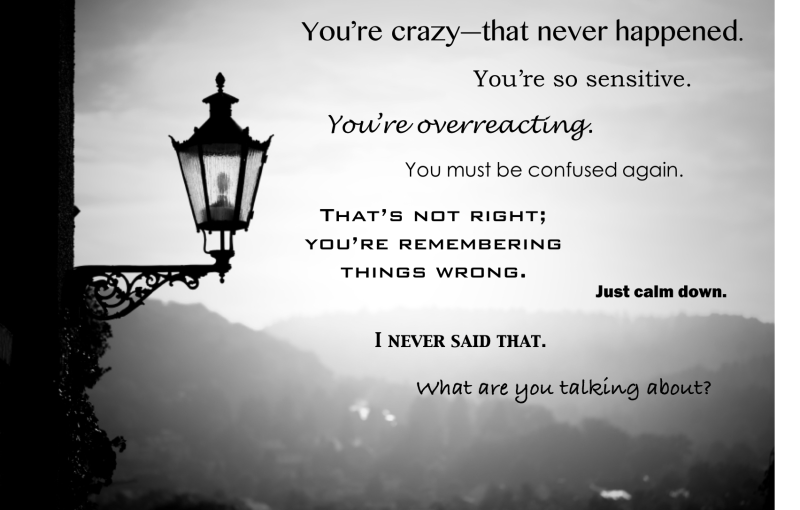 For example the Person will say they told the Victim days ago that they were going somewhere on a certain day, but the Victim doesn’t remember the Person telling them, this is because the Person is lying, they didn’t tell you at all – this is a form of gaslighting. The Person will tell a lie to the victim without regard as to whether they are undermining the victims sanity or perception of reality or not, they don’t care! The Person will use a systematic pattern of abuse by use of manipulation in a way that the Victim has the impression that they cannot thrust their owns senses. Gaslighting has also been referred to as brain washing. There are distinctive traits in the Victim that make them more susceptible to gaslighting. If you are empath, a lightworker, an intuitive sensitive or people pleaser kind of person, then you are more of a target as a Victim, for the Person. If you have been or are a Victim of gaslighting, please do not try to extinguish the beautiful light that shines within you, these qualities about yourself are gifts. Begin to view you’re caring and loving Self as a super power and not as the problem. Perhaps becoming more aware of boundaries and protecting yourself from people who do not have your best interest at heart. The Person will never see you for who you are, you cannot change them. No matter how much your mind feels like it is in knots, you can undo those knots and feel whole again. If you feel like you are punishing yourself in any situation, then stop. Talk to someone you trust, so you can begin to realize the truth and reality of what is happening to you. Be patient with how you feel, it will take time to recover from the gaslighting abuse that you have been a Victim of. Moving and shifting ourselves away from what we have been programmed to be attached to, does take work, a deep internal process will begin, just be patient, kind and loving with yourself.